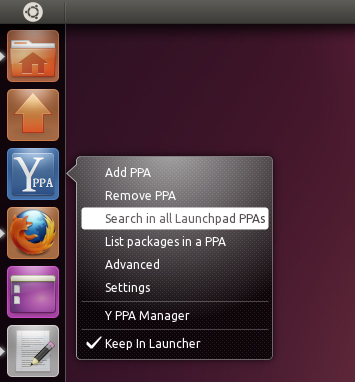 Y PPA Manager 0.0.7.5 has just been released, the new version adding quicklists for Ubuntu 11.04 Unity launcher. That means that you can now right click the Y PPA Manager icon and select to add a PPA, search all the Launchpad PPAs and so on without having to launch the main Y PPA Manager interface. The new version also comes with a lot of bug fixes like the icon not showing up (sometimes) in the Unity launcher, a bug that caused Y PPA Manager to ask for password multiple times when chaging the settings or using the PPA duplicate removal feature, changed some NotifyOSD icons, the Y PPA Manager icon when seen in Synapse / Kupfer, etc. uses the right font now and many other minor fixes and tweaks. To take advantage of the new "quicklists" feature, search for Y PPA Manager in Dash, drag and drop the icon on the Unity launcher and then right click the icon. If you find a bug, please report it @ Launchpad.